1. Preheat the oven to 300°F gas mark 2, 150°C (130°C fan-assisted). Line a 23cm x 23cm baking tray with parchment paper. 2. Over a gentle heat, melt the coconut oil, agave and date syrup until smooth and then set aside. 3. In a large mixing bowl add the rolled oats, salt, cinnamon, chopped pecans, sliced dried figs, desiccated coconut, sunflower seeds and dark chocolate raisins. Mix well. 4. Pour over the oil mixture, mix well and then place in the prepared baking tray. Press down firmly until smooth. 5. Bake in the preheated oven for 35 to 40 minutes or until golden. Let cool in the baking tray, then place in the fridge to harden up. 6. When ready to serve, lift out of the tin and cut into squares. Place back in the fridge if you have any to spare. These oat bars can be stored in an airtight container for up to one week in the refrigerator. 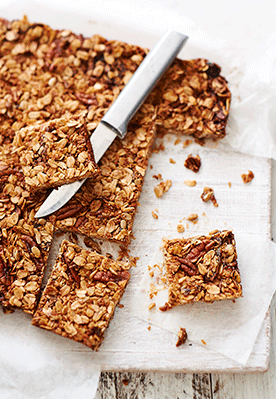 They are perfect for breakfast on the run as they are filled with protein and fibre. Once you start to perfect these bars, you can play around with the nut and fruit ingredients.